There are hundreds of thousands of thread spools in the world (I think "bazillions" is actually the technical term). How on earth do you know which one to choose? It's part science – what the manufacturers have designed the thread to do, and part art – what you like about the look and feel of the thread. One of our very first articles on Sew4Home was how to go about selecting the right thread for your project. It's still one of the most important topics to talk about; after all, thread is what's holding everything together! We worked with our friends at Coats to put together a handy overview that can help you understand not only the standard choices, but some of the specialty options as well. It was the dawn of the 1800s when Patrick Clark developed a method of twisting cotton yarns together to produce a thread so strong and smooth it could replace the natural silk used in the looms of the day. Coats continues to produce some of the best thread in the business. This is one thing I love about thread: the heavier the thread, the smaller the weight number. I wish my bathroom scale worked that way. If you want a fine thread for a fine fabric go for a 80 weight (abbreviated wt.). If you need a thick thread for a top-stitching accent, try a 12 wt. or 15 wt. This is how far a thread can stretch before it snaps. There are little robots in the thread factories that do nothing but stretch a thread to its breaking point day after day after day... much as your boss does to you each day. Thread is dyed in huge vats, but it's still possible for there to be slight color variations from batch to batch. It's best to buy all the thread you think you'll need for a project at one time to insure a perfect color match from spool to spool. This is where the fun begins. Talk about a rainbow of choices! There are so many beautiful thread colors on the market today. It's like that big box of 64 crayons, but without the waxy smell or the cool built-in sharpener. Choose a color that matches the most dominant color in your fabric. If you can't find a perfect match, go one or two shades darker. Light color stitching tends to stand out. Darker colors blend in. Soft cotton, organic blends, glittery and shiny -- beauty is in the eye of the beholder. Don't let anyone but your inner stylist tell you what is right or wrong. Go with the rules above for stretch and stability. Go with your heart for look and feel. The thread most people are familiar with, and the type that dominates the selection in fabric stores, is polyester or "all purpose." It's appropriate for the majority of fabrics and can be used for both hand and machine sewing. All-purpose polyester thread is great for knit, stretch, and permanent-press fabrics because of its stretch and recovery as well as its resistance to shrinkage. Coats' all-purpose thread is their Dual Duty XP, a polyester wrapped core spun thread that can be used successfully on all wovens and knits. It comes off the spool and goes through your machine with consistent tension and a balanced twist, creating a smooth, even stitch. Each spool has a trap lock at the top and bottom to hold the thread tail; this is really handy for keeping your used spools tidy. Dual Duty XP comes in three weights. The standard medium weight is a safe choice for most general sewing. This weight has the largest color range on the market with hundreds and hundreds of shades. There are also three specialty color groups: Fashion Brights - vibrant, almost neon tones; Color Tints - pale, pastel-like colors, great for baby items; and Multicolors - variegated spools that are fun for decorative topstitching. There is also Dual Duty XP Fine, which you can select for pucker-free seams on lightweight fabrics. We used it for all our Silk Color Block Pillows. And, Dual Duty XP Heavy, which is good for thicker fabrics as well as bold topstitching, cording, and buttonholes. We've used it on several of our bag projects, such as our Trendy Drawcord Backpack. If you need an even stronger thread in a heavier weight, look for Dual Duty XP Plus Jeans, which comes in that exact red-orange topstitching color that can be so hard to match. And since we're sewing jeans in our head right now, you might also want to look for their Denim thread. It's just an all-purpose weight for seaming and mending, but it comes in a perfect blended denim blue color. 100% cotton thread is best for light to medium-weight fabrics or delicately woven fabrics with little or no stretch. All-cotton thread has no 'give,' so the stitches may break if used on a stretchy fabric, like knit. Coats cotton thread options use 100% Egyptian Extra Long Staple cotton for both all-purpose spools and machine quilting spools. The cotton is mercerized for strength and luster. It's a popular choice for sewing or quilting on natural fibers. Another option is Coats Cotton Covered thread, which has the luster of natural cotton and the strength of polyester. And for traditional hand quilters, there is a cotton thread with a special "glace" finish that allows the thread to slide easily through multiple layers of fabric and batting. The specialty thread sampler pictured below is from Coats, however, you can certainly make our own. Similar to a decorative stitch sampler, this would be a good way to remember which thread goes with which fabric, or even more importantly, which thread has worked the best for you on various projects. We don't do a huge amount of machine embroidery here at Sew4Home, but we do love it, and as a thread category, it can't be overlooked... there are LOTS of embroidery threads out there. The most common is rayon. Coats & Clarks' rayon embroidery thread is specially engineered to provide a smooth finish and trouble-free sewing. The spools are the industry-favorite 40 wt. and have been tested to be compatible with most major machine embroidery formats. The pretty sheen of rayon also makes it a favorite choice of many people for decorative stitching. If your machine embroidery is going to be laundered often, try Coats & Clarks' Trilobal polyester machine embroidery thread. It's strong, durable, washable and colorfast. Choose from solids, multicolors and color twist. Their color twist is particularly interesting because you get a blended look rather than the color-blocked effect typical of variegated thread. Sometimes you need a little something extra to add strength, sparkle, texture or for a special purpose. This thread is a 100% continuous multifilament polyester created to resist almost every form of weather-related abuse, including UV rays and moisture. Outdoor Living thread is ideal for sewing or repairing cushions and pillows that live outside on your patio, such as our Outdoor Mini Mats. Usually reserved for top stitching or embellishment in home décor, this type of thread is made from metal strands twisted around a polyester core. There is a difference between hand sewing metallics and machine sewing metallics so check the spool before you buy. Silk is more elastic than cotton, so opt for silk if your delicate fabric has any stretch to it at all. Silk thread has great elasticity and strength and is a lovely choice for hand basting, securing hems, and delicate hand tacking. It is ideal for basting because it does not leave a permanent mark or impression on the fabric, and it does not tangle as much as other threads. For more about silk, take a look at our article on Sewing with Silk. You must have an "other" category! It's where we're putting wool, serger, nylon, monofilament, pre-wound bobbins, upholstery, beading, even glow-in-the-dark. These and others are the super-specialized heros of the thread world. You don't need them for most day-to-day sewing, but they can come to your rescue in unique situations. It's worth taking the extra time to make sure you have the right thread for the job. And as we always say: test before you sew for the very best results. @Jeremy - We reached out to our friends at Coats on your behalf. First, they wanted to send their apology for not having seen your original question: “ We regret any missed communication as we strive to respond to all questions about our products." Second, they clarified the difference between the two spools you are looking at: " The main difference is that Coats & Clark all-purpose is on a traditional spool and Dual Duty XP is on our snap-trap style spools. Both threads are 35 wt. 100% corespun polyester all-purpose sewing threads meaning they have a polyester core/polyester wrap." d they sell the "thread sampler"? @Cindy2 - No, the "thread sampler" is not for purchase, but it would be easy to buy a few sample spools and make your own. I would like to know where the weight of the thread is on the spool? or how to read the letters and numbers, and what they mean , that would help me a lot . I usually buy the coats and clark 100 % polyester . Thanks . Loretta . Great piece of information. Well, it is the toughest job for any quilter to select a thread to make the most from their work, and you are helping them with sucha fine results. I meant to include I have a Bernina 803 machine as well as a industrial treadle Singer 15-31 sewing machine made in 1915. I'll be using one of these to sew the awning together. Having the machine type might assist in appropriate needle selection. @ Douglas - we are a Janome studio here at S4H, so don't have particular experience with machines listed above. As mentioned in our reply to your comment below: testing is always the best option. Hello. I purchased outdoor fabric to make a replacement awning for a front door over-hang. The door gets direct sun exposure from noon until dusk. Your opinion on the Coats Outdoor Thread for durability or should I seek out Sunbrella brand outdoor thread? Also what needle shld I use in conjunction with the Coat outdoor Thread if I opt to go with the Coats brand. I've learned there is a slot in the back of every sewing machine needle that accommodates the guage thickness of thread. Douglas, Virginia Beach, Virginia. @ Douglas - for the majority of the heavy outdoor fabrics, a Denim type needle is traditionally recommended - although we have had no problem with a larger universal needle as well. Below is a link to our needle selection article. And, as we always say - it's best to test stitch on your exact fabric. Needles are much less expensive than fabric and worth buying some optins to test to make sure. I am not aware if Sunbrella makes their own thread. Great article and Coats is my go to thread. Thank you for the info! @ Quiltinglgw - you are welcome! The right thread can certainly make a difference. I am having a wee bit of trouble finding 'thick' silk thread. The kind of weight you would find that is used to make tassels. Any leads would be appreciated. 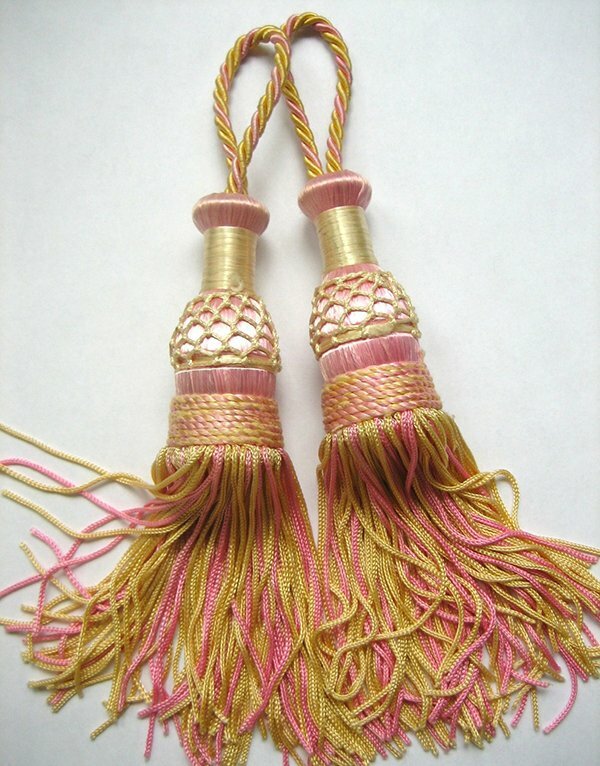 @ Mia - tassels are usually made using embroidery floss rather than spooled thread. Much faster :-) - Madeira makes one variety (linked below) that I know of, but I'm sure a quick Google search for Silk Embroidery Floss would uncover more. @ Mia - yes, embroidery floss is your best bet to achieve this type of look. Below is a link to our tassel making tutorial - obviously without the super fancy top. Floss is inexpensive; you could get several options and do some prototypes to see what you like best. Thanx a bunch. I'm looking!! I don't know how to gauge the thickness I want. Google! Thank you so much for this. I always felt I needed to go to thread college or something. What happened to the numbers that used to designate the size of the thread? - I can't find these numbers on any of brands I use! great article, but where it talks about making a Thread Sampler, the article just says ,"insert new image of thread sampler here". Huh? @ Shari Henry - somehow you must be seeing an old cached version of the page before that image was added. It is indeed there now. Try reloading the page to see if it appears for you. Wonderful article full of useful information. I've bookmarked it so I can refer back when I have questions. Thank you! @ Frankie - thanks! Thread is a category that grows and evolves all the time, but there are also some basics that stay consistent. This is one of the best articles I have read about thread. I knew there were different types of thread for different fabrics but this explains article explains it very well. Thank you Sew4Home and Coats.